On a personal note can I just thank everyone who has sent their best wishes to my mother. She was able to leave hospital only after 6 hours and best of all nothing terrible was found! She has spent the day with me (yeah - I even took a day off!) infront of the fire watching births on the Living Channel ( or something!) and trying not to push when it was the second stage! I bought this tea towel on Saturday and so fell in love with it. It is from a company from Copenhagan/Denmark called Green Gate which I probably like better (if truth be known) than Cath Kidston! 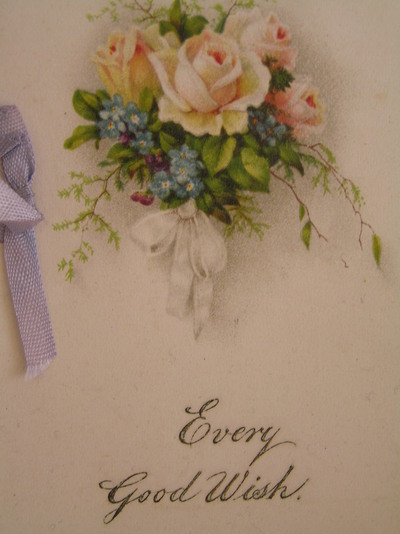 It is expensive, so I hardly have much from them , and it is very hard to find stockists in the UK - but it is so lovely and I prefer the faded colours they produce - look more vintage in my opinion. 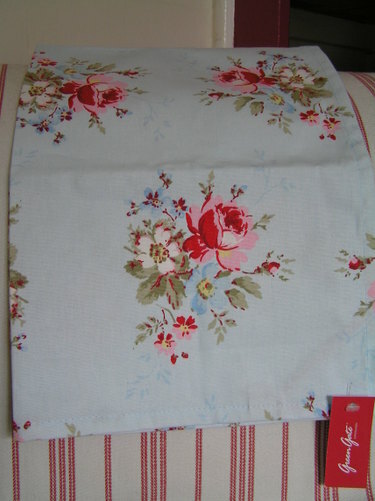 Anyway my tea towel was £5 and I couldn't resist and also couldn't bear to think of it drying dishes so my Saturday afternoon was spent at my sewing machine - yup fire on, radio on, husband watching the rugby, and children occupied...bliss! Needless to say I am thinking of shortening the frill as I feel that it is too long - that will mean a huge unpicking - so I will wash it first and wait for another Saturday! A prefered place to be! 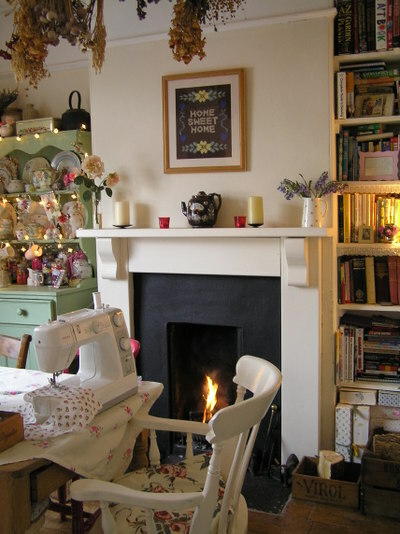 Just a picture of where I do my sewing. 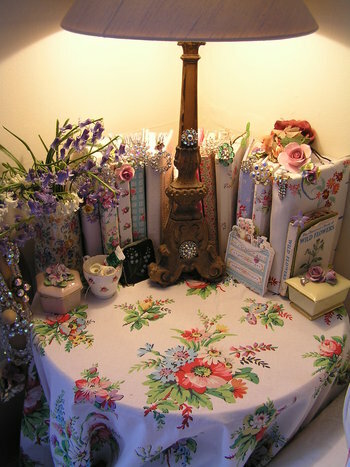 I have been enjoying seeing everyones' sewing rooms on Flickr. Unfortunately, I don't have my own room and have to use the dining room table but I do have a real fire to look at and the room can be very cosy. My machine is nothing special but does the job and has only seized up once in the 5 years I have had it. 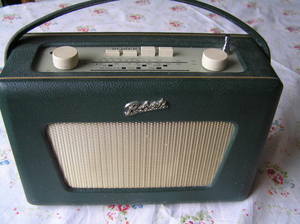 (which I hasten to add is the 'new' Radio 1!) especially Jonathan Ross who I think is the funniest man in the world, but I will leave him for another day! 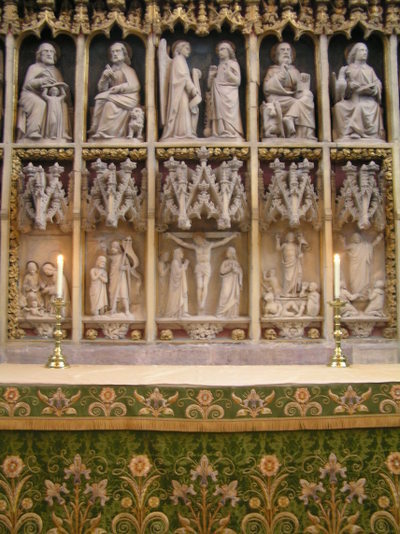 You can listen online and if you have a spare moment have a try - you never know you might like it! 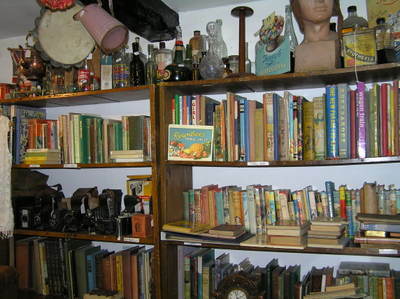 Well although they may be treasures, this time my travels did not produce anything that got my heart singing. Don't you just hate that sinking feeling when you go into known shops that previously have provided you with wonderful bounty, only to come out with nothing? 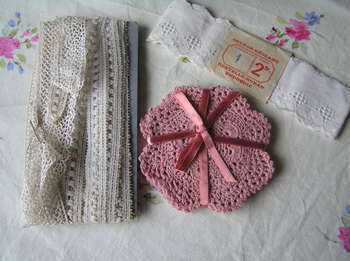 The pink crochet coasters are new and from Laura Ashley. I bought them with my newly painted bedside table in mind but may not hide them in the bedroom as they are so lovely - only £2.50 as well! 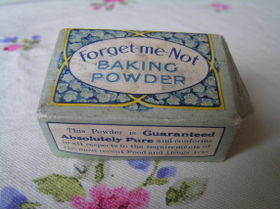 The baking powder now sits in my Printer's Tray (a photo of which is in my Flickr page, home set, though I do have 3 more around the house which I must take some photos of!). What a lovely name don't you think? 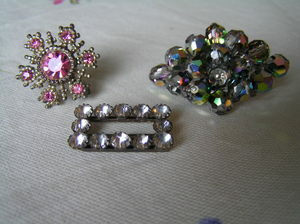 Some more brooches from Utter Clutter. 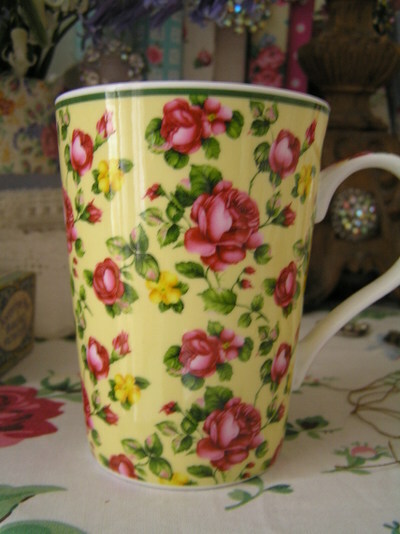 And yet another flowery mug! I woke yesterday to Alice telling me excitedly that we had snow! She hurriedly drew back the curtains and I, rather slowly (not too good in the mornings) sat up to see what all the fuss was about...the snow was just a dusting of ice! Had a smile to myself when I think of the wonderfully snowy pictures I have seen on my 'blog' friends' blogs! Still, it was an excuse to get more logs and light the fire and take a 'snowy' Devon photo. 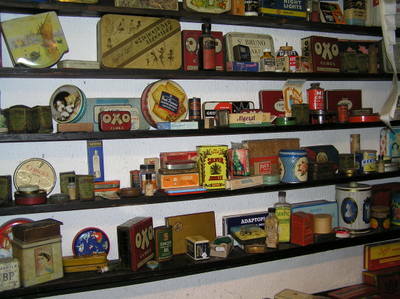 Here is one of my favourite shops - Utter Clutter! 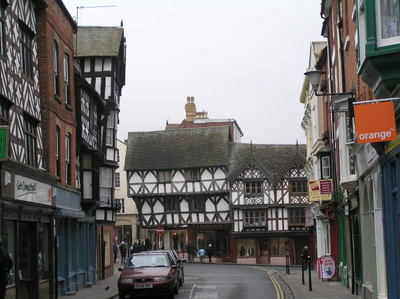 It is in a small town called Leominster which is about a 20 minute drive from where we were staying in Ludlow. 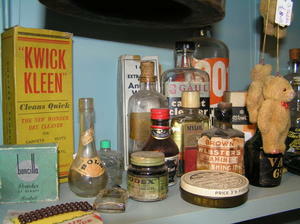 The town boasts some of the best antique/collectables shops I have ever seen. 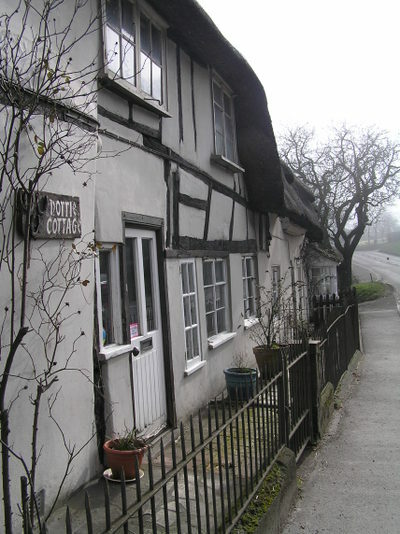 There are 2 shops which are huge houses that alone have about 20 rooms. 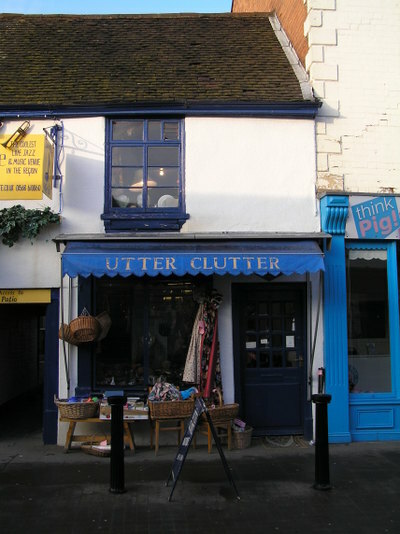 Infact I just love walking around the old houses which is all I can really do as most things are way over my budget so I stick to Utter Clutter and thrift shops! 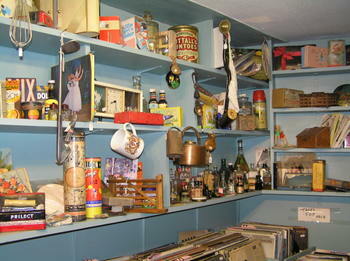 As the name would suggest, Utter Clutter is tiny but full - from ceiling to floor - of vintage goodness! The afternoon was so dreary and the shop (which only has 2 windows, 1 top and 1 bottom) so dark the pictures again are not the best quality. But far funnier was me trying to take photographs (with permission!) without including any of the 5 people already there plus an enormous trombone with which 2 gentlemen were doing goodness knows what to! infact lots of old glass bottles! 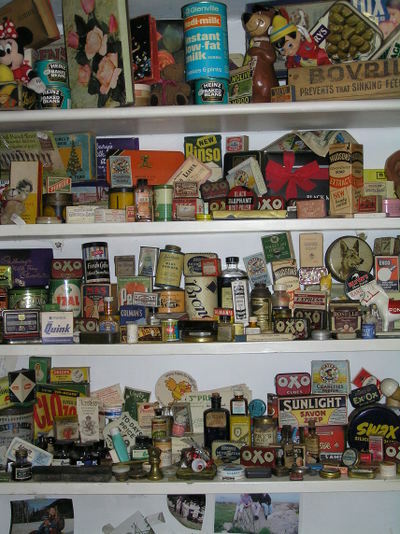 There is an incredible amount of old packaging which the owner has collected over the years. Yummy old tins - one of my favourite things to collect and I nearly bought that blue one with the pink rose on it, but it wasn't in very good condition so bought another sparkly brooch instead! 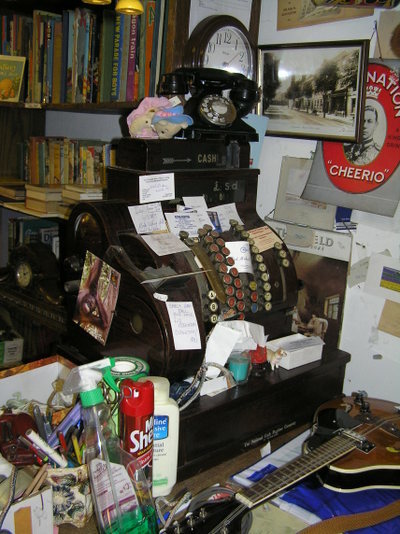 and a real working, vintage till! 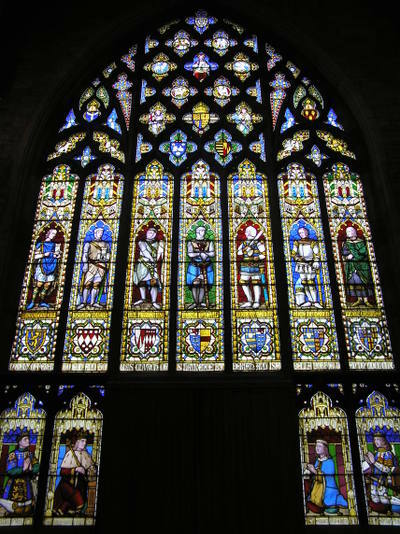 Tomorrow we are off for our few days break during the half term, so this will be my last post for 5 days but I will be back with some wonderful photos of the wonderful black and white tudor buildings around Shropshire and Herefordshire and the beautiful surrounding countryside. It will feel strange to be without the children but I am really hoping to find some wonderful treasures along the way..I usually do - and maybe order the beds! Oh what a sight caught my eye this morning when I looked out of our sitting-room french doors. 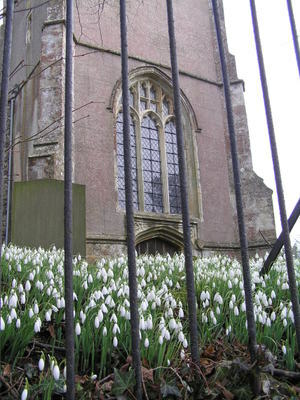 Our 1st snowdrop - still closed against the cold wind and with a rain drop still attached after the recent shower of rain. 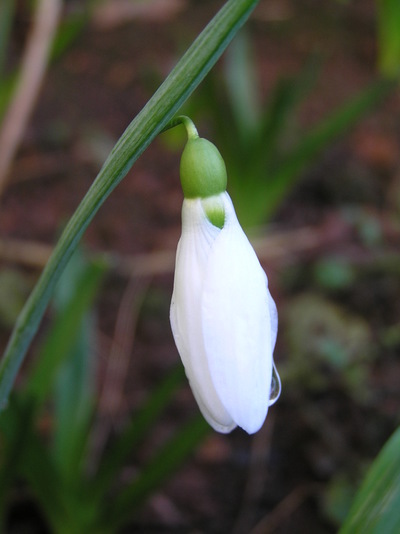 This snow drop came from my Aunt's garden in Shropshire which at this time of year is awash with them - huge ones - so last year she gave me some to plant in my garden. It had crossed my mind in early January that perhaps the move had damaged them in some way as I had thought they would have already been flowering, especially in our mild southern climate. But no, this one had waited until I needed the reassurance that my garden, which is looking sad and neglected, will again fill my heart with joy and that everything will again blossom and grow. Thought I would show you my favourite Christmas present. 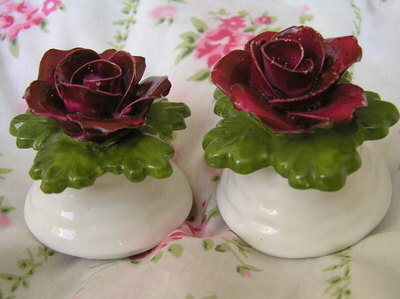 I found these in a florist shop, that also sold old flowery china, and persuaded Anth that I really, really wanted them. Yeah - I have to be direct in my approach as he is not a man who takes the hint! Anyway he hid them away and I had forgotten about them until I had opened them on Christmas afternoon. Disappointingly the holes in the top of them are both the same size and shape and are so big that your food gets covered with salt or pepper, which I'm not too keen on anyway! So instead they sit looking beautiful on my little shelf in the kitchen. On the other shelf (in the smallest kitchen in the world) I have this other set ...you know I have only just realised that I have the beginnings of another collection! I seem to be collecting so many things. 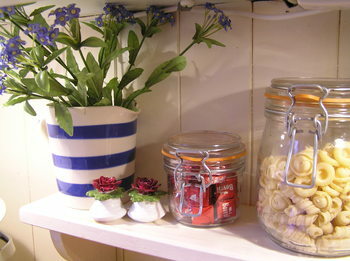 China (particularly with roses on) Kleenware, enamel, old tins (flowery of course!) 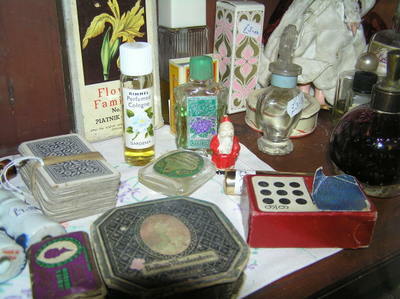 vintage needle packets, vintage Christmas baubles, fabric (always fabric), jugs, buttons and trimmings, vintage coathangers, crocheted lace, books, old embroideries - the list seems endless which is always why there is something to look for when visiting thrift shops! Well that is what I tell my family and on Ebay I can spend hours (and money!). It was the first day today that everyone was back at school/work in about 16 days! There has been terrible illness in the area, mainly in the schools. 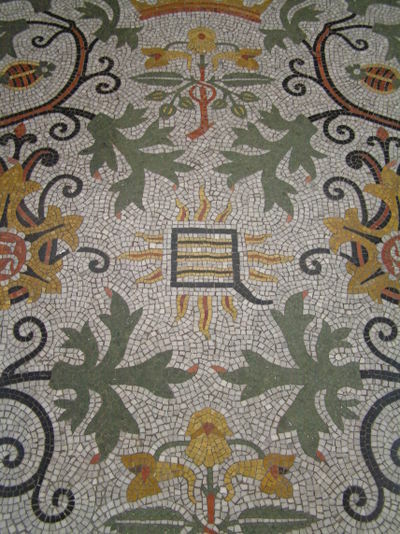 Thank you for all your recent kind comments - it still delightfully surprises me that there are people who find my ramblings of some interest! Next week is half term and we are off to Ludlow in Shropshire..probably one of the loveliest market towns in England and it is where my father lives..best of all it is teeming with thrift shops, antique and flea markets and I am going to do some bed hunting too - and an even bigger treat is that the children are off to stay with their other Granny & Poppa for 4 days and A & I will have some time by ourselves but...secretly I am dreading being away from them but don't tell anybody! This is a picture that I did for Alice about 14 months ago which is still waiting to be framed - like most of my finished samplers! 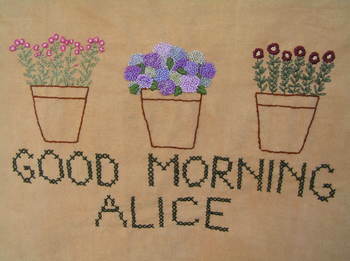 We are changing the girl's bedroom and my idea is to have this above Alice's bed and sew a different one for Lucy - my next project. My wish is to have black metal beds (dream would be old, antique! Dream on girl!) with a selection of quilts/eiderdowns on the top! But I'm having a problem finding any I like. I want them to have a foot board and to be a single bed size. Unfortunately we only have a 3 bedroom house so the girls have to share a room and now that we are getting rid of their bunk beds I realised just how hard it will be getting twin beds to fit. As it is we will have to build a wardrobe between the chimney breast and wall. 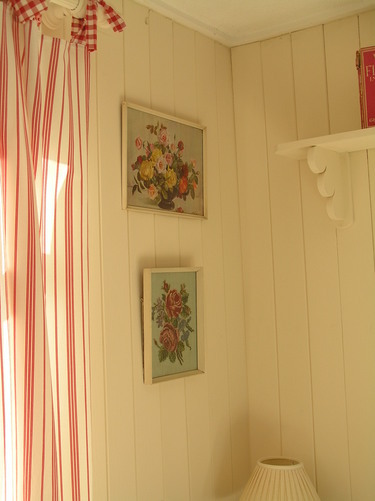 I was then going to cover the clothes with a curtain - yippee more vintage fabric to source! Actually it will be a big project and I'm trying to get enough courage to start..I'm just scared of choosing the right beds..it's hard when you are doing it online. Anyway today has been good though I'm trying hard to forget that I didn't win tickets to see Coldplay in the Abbey Road Studios who are playing as I write!! We (me, Lucy, Anth, & Matthew my brother) did see them in December at Earls Court. I really love their music and at the moment don't listen to much else. We had rubbish seats at the back but one day we will get closer - fingers crossed! There was great excitement in this house last night - the first episode of 24 (5th series) was screened and we are going to watch it tonight! We have so enjoyed all the other series and we didn't know until recently that there was a 5th one. My other T.V passion is the Waltons - that is my favourite all time programme and I have now got Lucy into it! I'm waiting for the 2nd series to come out on DVD in this country but meanwhile the Hallmark channel repeats them..bliss..life was so much more uncomplicated then and the real values in life were celebrated. Would I be able to live without my computer and camera though- mmm no washing machine either? Oh well the thought is good! Well the television is calling, or should I say Jack Bauer! Well the paint has dried - good gracious doesn't gloss paint take an age to dry - and at last there is somewhere to put my underwear - thank you family for stepping over bags of socks, knickers, and the special top bedside drawer bits! The picture isn't particularly in focus and I did choose the sunniest 5 minutes but something isn't right..I'm loath to use the flash as it is so harsh. Today I even managed to sew and finally made that pillowcase that I had been yearning to do. 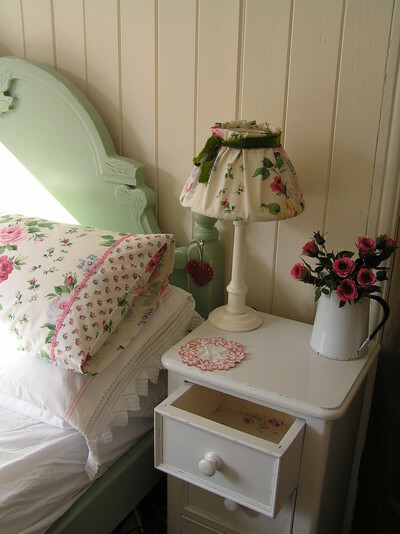 The fabric is from Laura Ashley , it is an old one that they have brought back again and I really love it. I made a lamp shade in it too. That was a first! 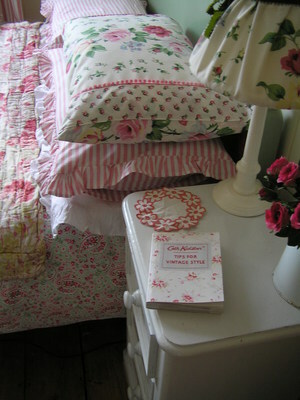 The striped pillowcase is from a charity shop - infact all my pillowcases are, though I don't tell everybody as some people would never stay at our house again! Today is the first day that everybody has been better though the sound of coughing can be heard every few minutes! Lucy has just taken part in a competition in public speaking. It has taken the whole afternoon and I am so proud of her. They were in teams of 3 - a speaker, chairperson and a vote of thanks. 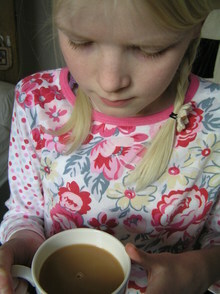 She had been chosen at school to be the speaker and had decided to do the 6 minute speech on Fairtrade. I was so nervous for her but she was brilliant and their team came 2nd. She spoke clearly and loudly which many of the others didn't. Well done darling! We also got Tom's report on Friday and that was good - what is more important to Anth and I is the childrens' attitude towards their work and teachers. They may not be high flyers but manners and consideration for others is what we strive for in our family. I have noticed the last few days a destinct feeling of spring in the air. The shoots of my daffodils are poking through and there are buds on my honeysuckle. 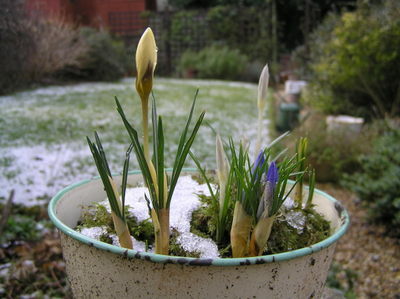 Even though I am a winter girl it does gladden the heart when there is a freshness all about. Living in the south west of England, and especially on the coast, we do have quite a mild climate compared to the rest of Britain. This weeks corner is perhaps my second favourite in our home. It is in our bedroom and apart from the tongue and groove panalling, I really love the pictures which I found in 2 different charity shops. 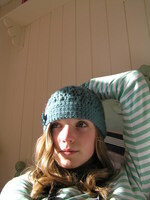 One was a £1 and the other one, which is hand sewn, was £1.50p! 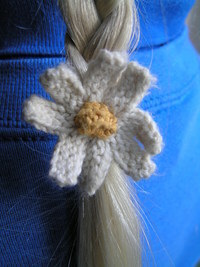 It always surprises me that some people put such little value on handmade things thinking of them as old-fashioned. My friends often laugh at my 'old lady's' love of vintage florals and embroideries, enamel etc but now these things are coming back into fashion thanks to the likes of Cath Kidston and Rachel Ashwell. 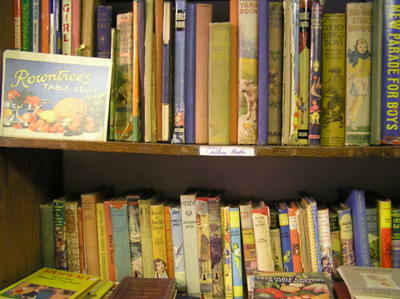 Great I think but now I'm not the only one who is seeking such treasures in charity shops and secondhand stores, and I have noticed the price change as people are now aware that there is a market for 'vintage'. Still nothing beats the thrill of finding something that makes you feel good everytime you look at it! 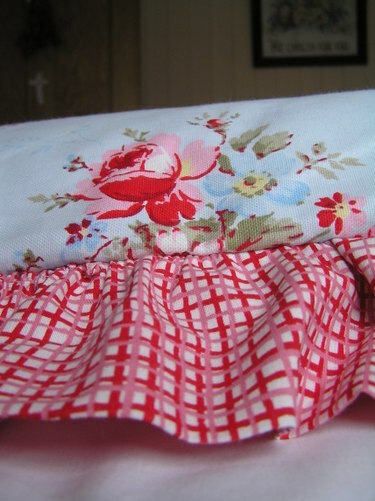 Hoping to do some sewing today - want to make a pillowcase. I have painted my lamp base and tonight hopefully will make the lampshade. Things just take so long! 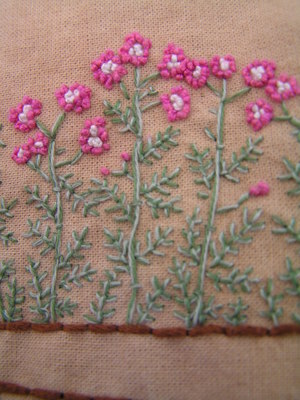 I have these plans that I will spend the day sewing and it never seems to happen - there is always so many other things to do first and then I spend ages dithering over fabric and and what should go with what and before you know it the children are back from school and the time for taking up the diningroom table with machine/fabric/radio/pins/thread/cup of tea etc is over! Well the painting is on course but I am a bit behind because I have spent quite a long time chatting on the phone today! But I have been busy over the last few weeks making yards and yards of 'vintage' bunting. During my many, many trips to charity shops (thrift) I always end up on my knees rumaging through endless baskets of linens and old-fashioned tray cloths (which happily for me people just discard) and now have quite a selection with which I use for quite a few projects. Keep watching this space - I'll get around to photographing them as soon as the weather brightens up. 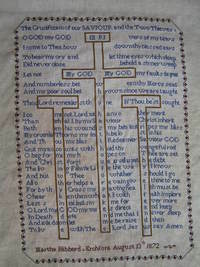 Anyway, I have used the vintage embroideries as the flags and it looks quite effective. They are to be brought on birthdays,high days and holidays, or whenever we need alittle cheering up. As I've had 1 child off school last week, and another this week, I have been able to almost (just 20 stitches more!) 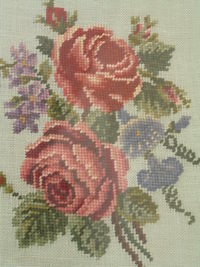 finish the sampler that has taken nearly a year to sew. 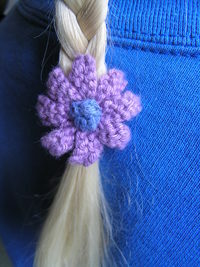 Isn't it wonderful to be nearing the end of a project? 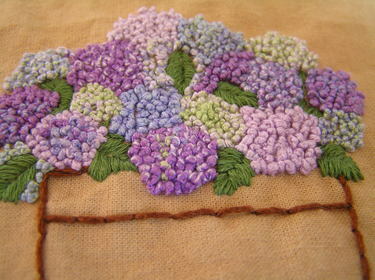 Im going to settle down tonight infront of the fire and do that final stitch. Well this is the before picture. 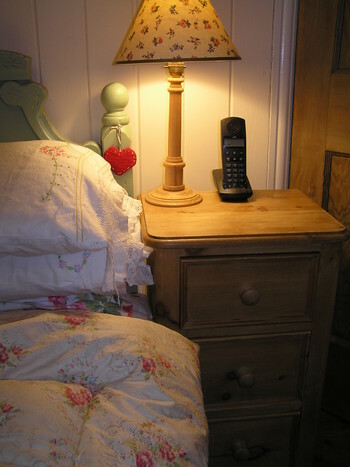 I've been dithering as to whether I should paint my nightstand (or as we British people call it - bedside table!). The bed is painted and I am really into the 'Shabby Chic' look of distressed furniture but something has always stopped me. Well no more! I am going to be more confident in my approach to changing my home -I'm going off to do it now and I will post back - with pics of course.